Congratulations to our four student athletes on signing their letter of intent to play in college. Drake Reid (football), David Robinson (football), Noah Scott (soccer) and Kaitlyn Godwin (soccer). This makes 14 total athletes (10 signed in the fall) who will continue their athletic careers in college. Drake Reid– – Drake has been a 4 year starter on Varsity; and two-way starter on offense and defense; hes a two-time team captain; three-time all-league player; and led his team in receptions and interceptions as a junior and senior. 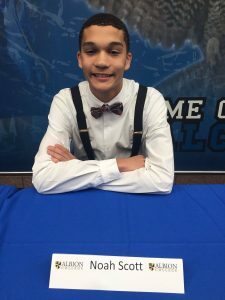 Drake has a 3.8 GPA; was honorable mention academic all-state; and a multi-sport athlete who participates in Basketball and Track & Field; Drake will attend Wayne State University. 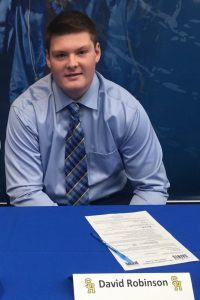 David Robinson– David has started 3 years on Varsity as an offensive lineman; was All-league as a senior; currently has a 3.6 GPA; is multi-sport athlete who participates in wrestling & track & field; was an all-league thrower last track season and will attend Sienna Heights in the fall. Noah Scott– Noah was a three year varsity member of the Falcon soccer team. He started every game his junior and senior year. Over the course of his varsity career he had two goals and 9 assists. He was a key member in back to back district title runs and regional runs in 2016 and 2017. He is a very hard worker, a great teammate, and unselfish on the pitch. Noah will continue his soccer career at Albion college next school year. 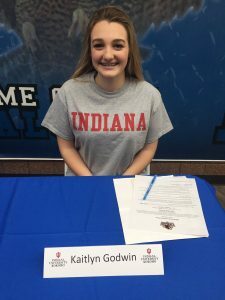 Kaitlyn Godwin– Kaitlyn is the second RHS girls soccer player to sign on at the collegiate level and has been a 4 year starter as the goalkeeper. Kaitlyn has had 30 shutouts in net the past 3 seasons and has been awarded all district and all league awards several times. She also served as the captain the past 2 seasons and quoting Coach Dustin “She is an incredible player, but very humble at the same time, a tireless worker always looking to improve her game”.